Our client Shannon Group is an established Branding and Behaviour change agency involving print and web media. The company’s key areas of staff consist of a creative and digital department in addition to their administration division. ODC Design was recently engaged to refurbish our client’s existing tenancy from their previous tired and generic space into a new look and feel that is relevant with their company today. The objective of the project was to design a space that creates a productive workflow promoting communication and improving the business structure while also retaining various existing furniture and layout. The result was a complete transformation of space. The inspiration for the design was guided by Shannon Group incorporating their corporate logo colours. The design includes a predominantly lively colour palette with feature angled flooring and finishes in the front of house area to bring a vibrant feel to the space. 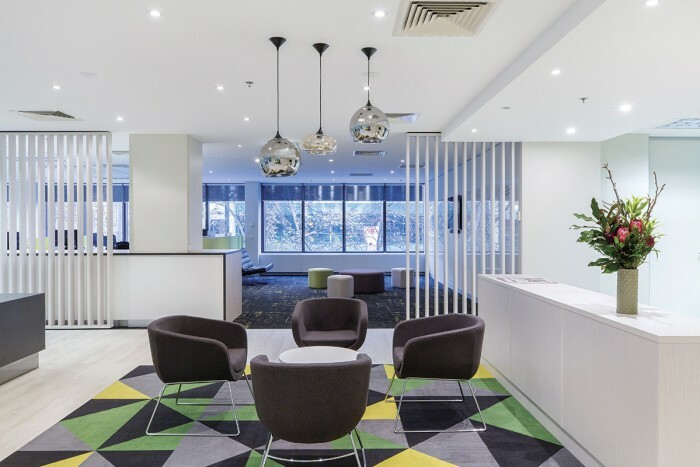 Slated screens were installed in a light timber laminate and elegant pendants adorn the waiting area giving the office a modern finish and to reflect the agency’s creative vision. The back of house features splashes of citrus to a predominantly open plan arrangement designed to encourage communication and collaboration among staff. The new layout also incorporates environmentally sustainable design principles with the introduction of live planting in storage units positioned throughout the workstation area. The character of the lobby area was designed in close collaboration with Shannon Group who proposed the use of street art walls and personally contributed their existing loose furniture to create the dynamic space. The overall project took approximately six months from design solutions, documentation, contract administration and construction, resulting in a solution that creates a calm, open and communicative space which reinforces the Shannon Group brand.